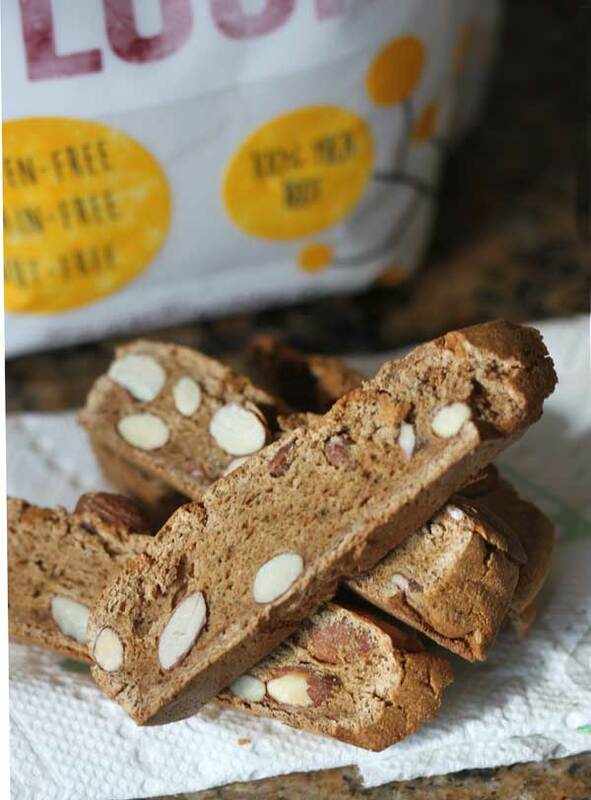 Cassava Flour Biscotti is a crunchy, oil-free biscotti made with cassava flour, coconut sugar and whole almonds. You can use whole roasted almonds or raw almonds. In a second bowl, using an electric mixer, beat the eggs until light and foamy. Add the sugar and vanilla and beat for another minute. Stir the dry ingredients into the liquid ingredients. If the dough seems dry, add water one teaspoon at a time until it comes together. You may not need any. Add the nuts (if using) and using your hands, knead them into the dough so they are evenly distributed. The dough will be thick, yet pliable and easy to shape. Shape the dough into a 10 x 2 1/2 inch log directly on the baking sheet. Bake log at 300 degrees F. for 40 minutes. It will spread a just a bit and the top should crack slightly. Remove from the oven and let cool for about 5 to 10 minutes. Transfer log to a large cutting board and using a sharp knife, cut the log every 1/2 to 3/4 inch on the diagonal. Stand the cut biscotti on the baking sheet and bake at 300 for about 20-30 minutes. If you sliced the biscotti thinly (1/2 inch thick or less) check at 20 minutes. Let cool on a wire rack. It should crisp as it cools. You can make this with or without the nuts. Both versions taste great! It's crunchy, but a little softer than biscotti made with flour and sugar.